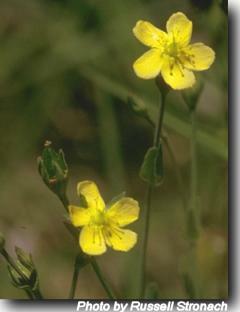 Yellow, solitary, 1.5cm across, 5 petals. Slender, hairless, perennial herb. Stems erect & rigid. Widespread and common in pastures & grassy places. Can self- seed very easily. Fresh seeds are dormant. The highest germination of non-dormant seeds has been found to occur in the light at approximately 25-35˚C. Suitable below powerlines. Propagated from seed. Do not sow or cover too deeply. Strikes easily from small cuttings of all but the very softest material.